Papers: Correspondence in Amistad (Schooner) case collection, 1839-1968. On 6 microfilm reels of originals in various repositories. Finding aid. Papers: 2 letters (October 4, 1844 and no date) and naval appointment (February 10, 1844). Papers: Ca. 10 items in the John Caldwell Calhoun papers, 1784-1888. Finding aid. Restricted. Papers: In Tyler family papers, 1664-1934. 55,130 items. Correspondence and collected papers of Tyler and members of his family. 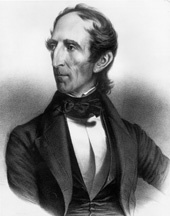 Includes 175 items of John Tyler. Finding aid. Papers: Correspondence in Thomas Addison Burke papers, 1827-1860. Finding aid. Papers: Correspondence in Simon Gratz collection, 1677-1910; Daniel Parker papers, 1800-1846; Bradford family papers, 1747-1847; and Presidents of the United States autographs. Papers: 15 letters and documents (1839-1857) in various collections. Finding aid. Papers: 1 letter (April 2, 1855) in Bookfellow Foundation autograph collection, 1793-1945; and 1 letter (March 15, 1842) in Sang autograph collection, 1751-1954. Papers: 1691-1918. 3 linear feet. Correspondence, autograph collection, and family papers reflecting social life of Virginia. Available on 3 microfilm reels. Finding aid. Additional Papers: 1 container (1814-1884); correspondence when Green was President Tylers unofficial representative in Paris and London (1840-1844) in Duff Green papers, 1813-1879; and correspondence in Commissioners of the City of Washington records, 1791-1869 (bulk 1791-1808), available on 1 microfilm reel. Papers: 41 items (1841-1861) in various collections. Papers: In Robert R. Church family papers, 1800-1978. Papers: [ca. 1843-1844]. 4 items. 3 letters and 1 document. Papers: 10 items (1819-1898); and 18 items (1820-1859) concerning various political issues in the Gilder Lehrman collection. Finding aid. Papers: Land grant (signed 1844) in the Long Island collections. Papers: 1826-1861. Ca. 378 items. Additional Papers: Correspondence in Samuel Barron papers, 1820-1899; Gordon family papers, 1812-1916; personal letters and business papers postdating his congressional service in ca. 30 collections; engravings; and 3 microfilm reels of originals (1691-1918) in the Library of Congress. Papers: Unknown quantity and photographs in various collections including the Lewis L. Strauss collection, 1749-1885; and Julia Gardiner Tyler papers, 1844-1946. Papers: Gubernatorial papers (1825-1827); executive letterbook (1825-1827); 3 letters (July 29, 1835; December 27, 1852; November 24, 1858); and 3 microfilm reels of originals 1691-1918) in Library of Congress. Additional Papers: In Arter family letters, 1864, 1919; Johnston family papers, 1779-1891; Tucker-Ewell family papers, 1770-1893; Granbery family papers, 1781-1927 (bulk 1859-1865); and Tazewell family papers, 1772-1866. Finding aid. Papers: 1739-1930s. 1 box. Notes and copies of correspondence compiled by Oliver Perry Chitwood for his biography, John Tyler: Champion of the Old South (1939). Papers: 3 microfilm reels of originals (1691-1918) at Library of Congress; correspondence concerning his courtship of Julia Gardiner in Gardiner-Tyler family papers, 1843-1898; correspondence in Harry H. Ensign autograph collection, 1818-1880; Benajah Ticknor papers, 1818-1852; Louis Mayer Rabinowitz collection, 1676-1957 (bulk 1765-1915); and Alfred White Van Sinderen collection, 1782-1969. Research Libraries Information Network In addition to the institutions listed above, items are also cataloged in collections at: Alabama Department of Archives and History, Montgomery, AL; Brown University, Providence, RI; Cornell University Libraries, Ithaca, NY; Dartmouth College, Hanover, NH; Hagley Museum and Library, Greenville, DE; Johns Hopkins University Library, Baltimore, MD; New York State Library, Albany, NY; Stanford University Libraries, Stanford, CA; Syracuse University, George Arents Research Library, Syracuse, NY; University of Iowa Libraries, Iowa City, IA; University of Michigan, Bentley Historical Library, Ann Arbor, MI.